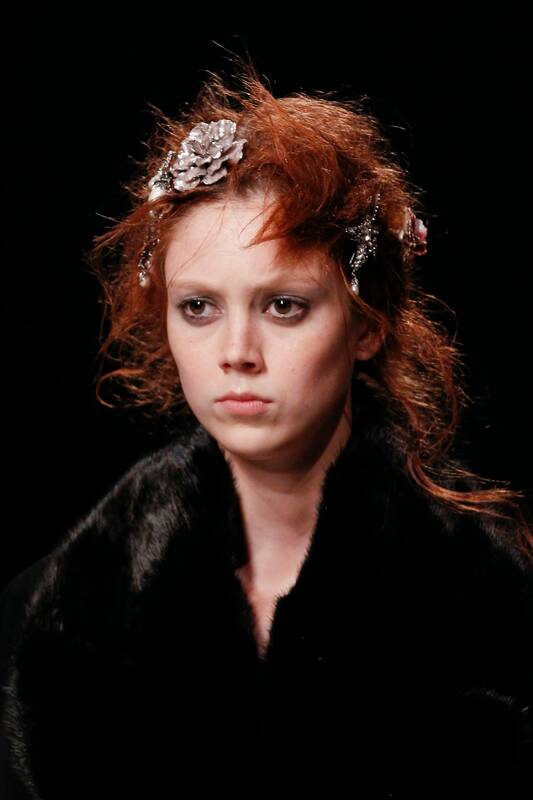 I’ve been admittedly feeling uber fatigued about fashion week season this year. As much as I’ve been ‘keeping up to date’ with the shows and the collections and the trend reports, I’m just not ‘on it’ as much I have been in previous years. There wasn’t really a set of collections or pieces that really made me go ‘GOD YESSSS’ recently. That was until my eyes laid rest on the ever reliable Alexander McQueen line and BAM. I’m back in. This sumptuously dreamy take on the female form won’t come as a surprise if you spotted Burton’s Pre-Fall offering in Paris. F/W was one of the most feminine collections we’ve seen from Burton and McQueen for a while but the ‘look’ was appropriate for a homecoming show after years away presenting in Paris. The pieces themselves hung so very delicately on the models. 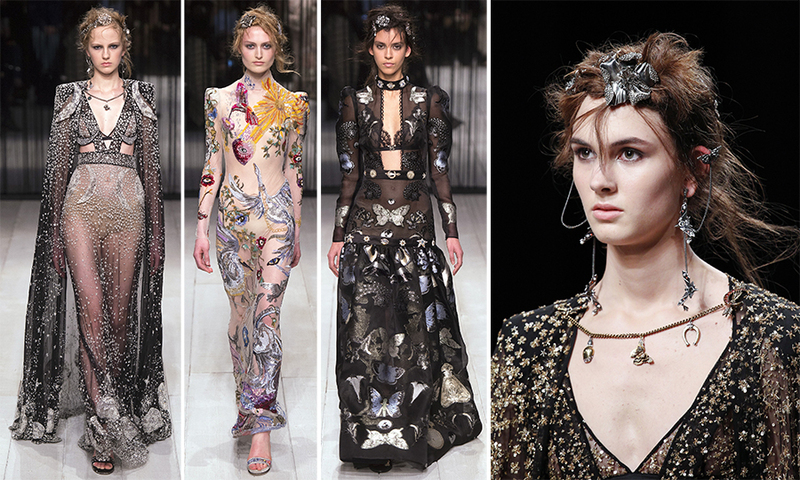 Some fabrics threadbare and intricate as the butterfly motiffs that adorned them. Though the juxtaposition between leather and lace are so precisely intertwined the ever present corsetery on display in a McQueen show were looser, the jackets less bound. 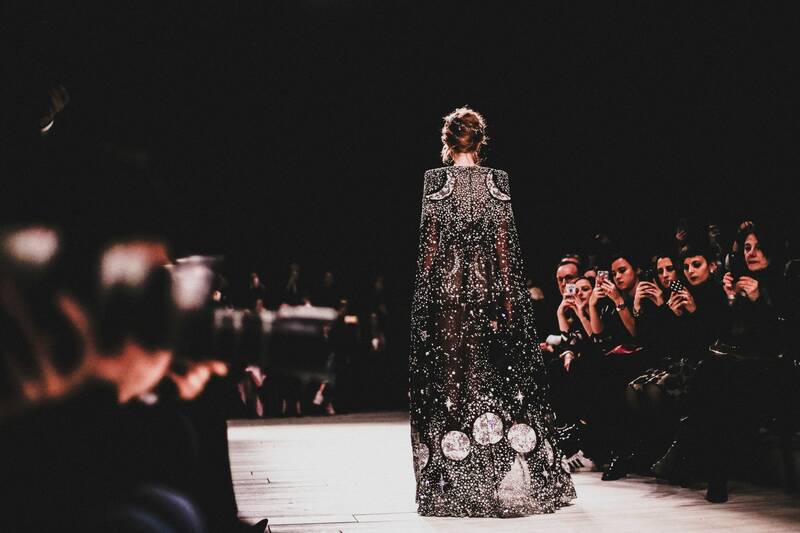 The McQueen woman this season walked with more freedom of will, with her soul laid bare for the World to see. This coupled with the dewy make up choices and sultry smokey eyes made for a mesmerising and nostalgic sight. Both in the sense of presenting the flapper girl undone (with models adorned with crystal headpieces and ruffled hair) and a fitting Burton-esque tribute to McQueen’s signature sharp tailoring – particularly with the evening gowns towards the end. An in a perhaps twist of fate? This season’s collection held a sprinkling of Bowie in their eccentricity and gender fluid tailoring lines. Whether a fitting tribute to a musical icon who too found their home in similar spaces to McQueen in eras of British experimentation where their creativity and risk taking thrived. Burton’s nailed that glamour down perfectly whilst still maintaining the McQueen edge I adore. Brava! Thoughts on Burton’s blissful McQueen presentation? How about pinging me some of your favourite looks/collections from the F/W 2016 season so far for me to check out!